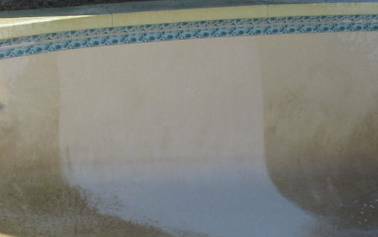 Swimming Pool Acid Wash Service in the Sacramento Area - Before and After in one area. This is a fantastic option for those looking to escape all of your chemical and natural staining inside of your swimming pool. Throughout the life of plaster, stains will develop that make the plaster lose it’s previous “new plaster” appearance. That is why we recommend a pool be drained and Acid Washed every 5 to 7 years to remove discoloring caused by metals and/or chemicals. Our Acid Wash will generally remove superficial stains, fine scale deposis, and various colored deposits from the plaster at a cost depending on the condition of the pool. Major factors include the size of the swimming pool, and the level of service (i.e. a Light Acid Wash Service or Heavy Acid Wash Service ). Typically, one will choose which level of service based on the age and/or plaster condition. If the plaster is newer than 10 years, one may choose a Light Acid Wash Service to remove recurring stains. If the plaster is older than 20 years, and has never had our Acid Wash Service, one may choose to perform a Heavy Acid Wash service to remove old, deep stains. 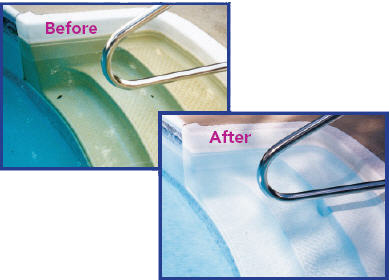 A client can typically expect their pool plaster to look 65-95% brighter than before. Our Acid Wash Service removes stains 2-9mm thick. Luckily, the Sacramento area does not have “Hard Water”. Therefore, we see the need to re-acid wash occurring far and few between. Additionally, we see much better results than many other areas in California. Please be advised that licensed individuals who are trained in acid washing techniques should only perform acid washes, it is extremely dangerous and VERY hazardous to your breathing, you WILL hurt yourself. So if you decide to do it yourself, please shoot me a call or email and I will give you additional pointers. Trust me, I do not mind. For those swimming pools in areas of Sacramento that are on metered water, near, or in low lying areas this is an alternative service for you. This process uses a custom, in-house chemical process, that is added to the pool water over 6 weeks. The cost is also substantially lower generally $255 or more depending on the size of the swimming pool. The process includes an addition of a diode, chemicals, and depending on severity, a wire brush application to loosen up any agitated organic compounds. I find this process to be just as responsive as most drained acid washes for removing organic staining. I figured that if you read this far down you deserve to know a few of the pool service secrets that us technicians have come to experience in the Sacramento area. I recommend this to anyone worried about their pool lifting, draining, or even applying the concentrated acid directly to the plaster surface. Ask for this service by name “The No Drain Acid Cleaning Service”. Fact: Swimming Pool Plaster can last 50-75 years if maintained correctly, (i.e. PH levels are kept in line with water constituent guidelines). Fact: On average Swimming Pool Plaster at its thickest is 1/4 inches thick. However, at its thinnest it is 1/16 inches. Fact: Chemical Reactions occur inside your swimming pools water. An acid wash or acid cleaning service removes the results of those chemical compounds reacting with one another. Fact: To date, our Acid Wash Service is 3x more popular than our Acid Cleaning Treatments. Thinking, Contemplating, Dreaming About Acid Washing your Swimming Pool? Do you live in these cities or outlying areas?